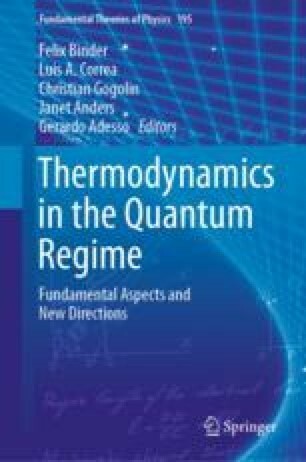 In this chapter, we illustrate how a trapped ion system can be used for the experimental study of quantum thermodynamics, in particular, quantum fluctuation of work. As technology of nano/micro scale develops, it becomes critical to understand thermodynamics at the quantum mechanical level. The trapped ion system is a representative physical platform to experimentally demonstrate quantum phenomena with excellent control and precision. We provide a basic introduction of the trapped ion system and present the theoretical framework for the experimental study of quantum thermodynamics. Then we bring out two concrete examples of the experimental demonstrations. Finally, we discuss the results and the future of the experimental study of quantum thermodynamics with trapped ion systems. This work was supported by the National Key Research and Development Program of China under Grants No. 2016YFA0301900 and No. 2016YFA0301901 and the National Natural Science Foundation of China Grants No. 11374178, No. 11574002, and No. 11504197.